Water height : -4in to 0in Water temp : 56-64f Another week with very little to report in terms of catches, although there are signs that things are starting to change. The river flucutated by a few inches throughout the week with some intermittent rain giving small rises however it still never made plus on the camisky gauge. A few more fish were seen in some of the main holding pools indicating that even the small rises may have just been enough to get fish on the move! 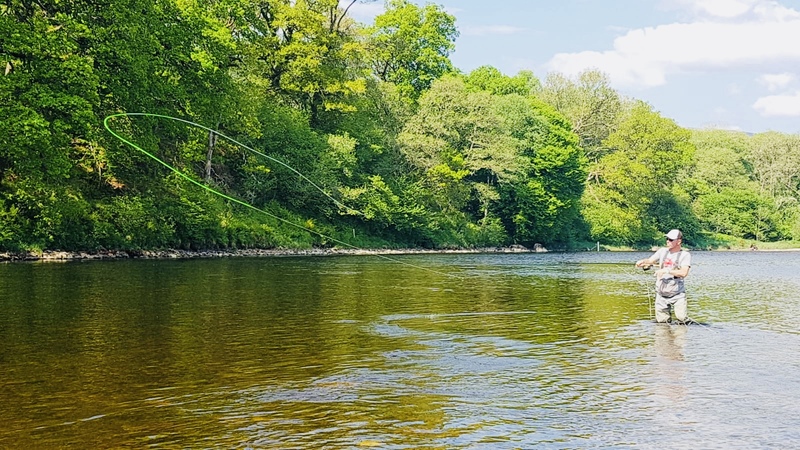 The upstream beats were very lightly fished throughout the week with just a few rods venturing out for a few hours each day......and as such not much action was to be had ! However, as we know in salmon fishing, perserverence sometimes brings reward......and it certainly did for RLA chairman Andrew Shaw. On Saturday morning he managed to land a lovely salmon in the mid teens of lbs from beat 4. The forecast for the next few days looks slightly more promising with rain and clouds featuring more than sun and blue sky! The river does need a proper flush out so let’s hope it comes this coming week! River height : -2 to -4in River Temp : 60-64F Sadly I have very little to report from last week. The river remains desperately low and the fish are simply not running! Prolonged dry spells such as this typically change the migratory mood of the salmon and they will often choose the safety of the deep Loch to the vulnerability of being in the river in such low water conditions. Even down on the Tailrace beat, the fishing was slow. Local angler Chris Cairns managed to land a lovely 8lber but I am not aware of any other fish caught. 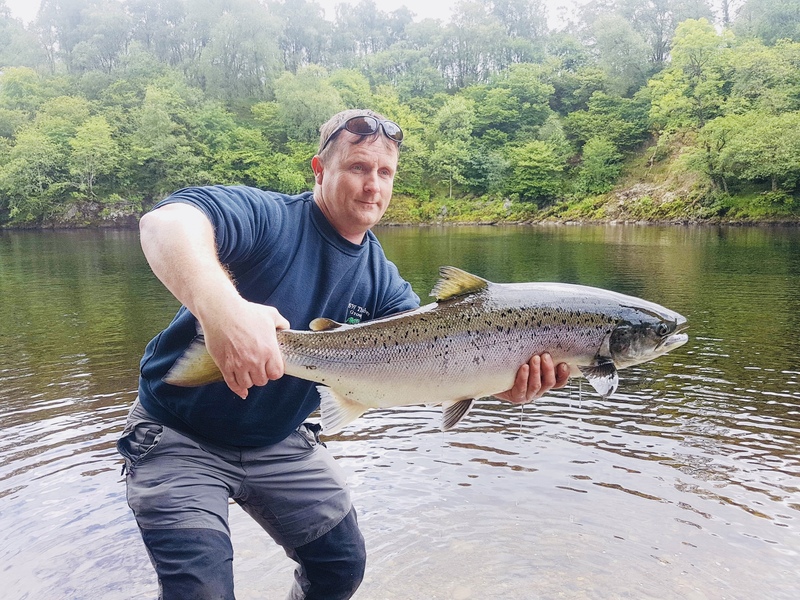 There are a few Salmon and Grilse now holding in the main pool and others seen coming in on the tides but I believe the bulk of the fish are staying in the Loch awaiting a change in river conditions. As I write this, the rain is falling - but will it be enough?? Let's hopes so! Sadly I have very little to report from last week. The river remains desperately low and the fish are simply not running! Prolonged dry spells such as this typically change the migratory mood of the salmon and they will often choose the safety of the deep Loch to the vulnerability of being in the river in such low water conditions. Even down on the Tailrace beat, the fishing was slow. Local angler Chris Cairns managed to land a lovely 8lber but I am not aware of any other fish caught. 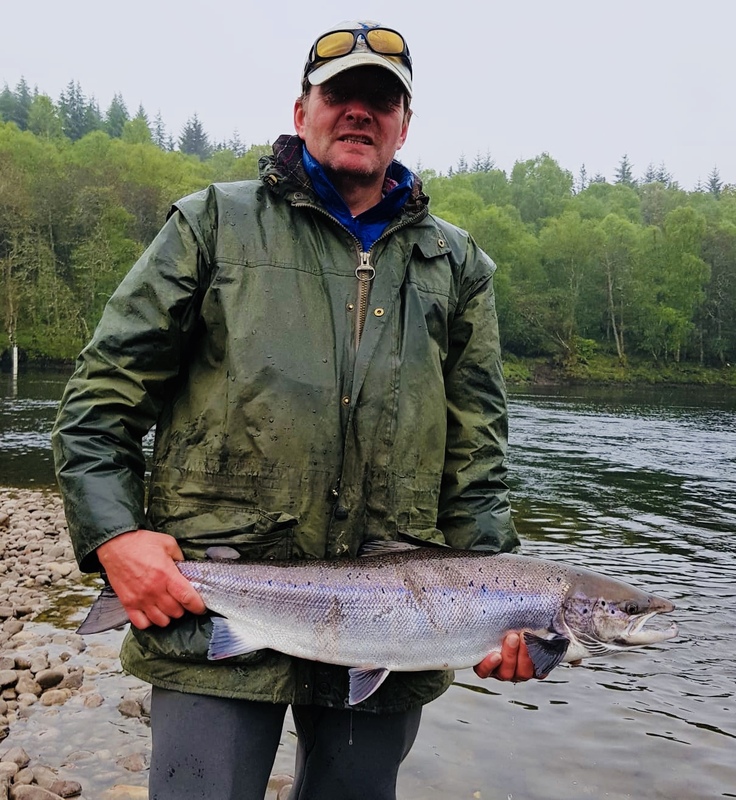 There are a few Salmon and Grilse now holding in the main pool and others seen coming in on the tides but I believe the bulk of the fish are staying in the Loch awaiting a change in river conditions. As I write this, the rain is falling – but will it be enough?? Let’s hopes so! Water height : -4in Water temp : 67-70F Last week was simply a continuation of the week prior - Very low river conditions, high water temperatures and little cloud cover. 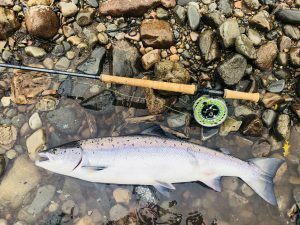 The air temperature did drop mid-week which made it feel more comfortable to fish but this made little difference to the upstream rods battling the extreme low water. No fish were hooked or landed on the upstream beats! The only chance of a fish was down on the Tailrace and even there it was still challenging. However 2 salmon were landed by the club anglers - Rab less had an 11lb and Brian Tolmie a 6lber. The upstream rods had a hold of 2 but sadly they fell off! Both salmon and grilse were seen coming in and out with the tides but I would think that many of them will be further out in the Loch awaiting a change in weather and river conditions. Brian Tolmie - sealiced 6lber. The forecast for next week is not so encouraging. Although there maybe some rain mid-week I doubt it will be sufficient to make any difference to the river......and then a return to brighter days and high temps. When will this drought end??? Last week was simply a continuation of the week prior – Very low river conditions, high water temperatures and little cloud cover. 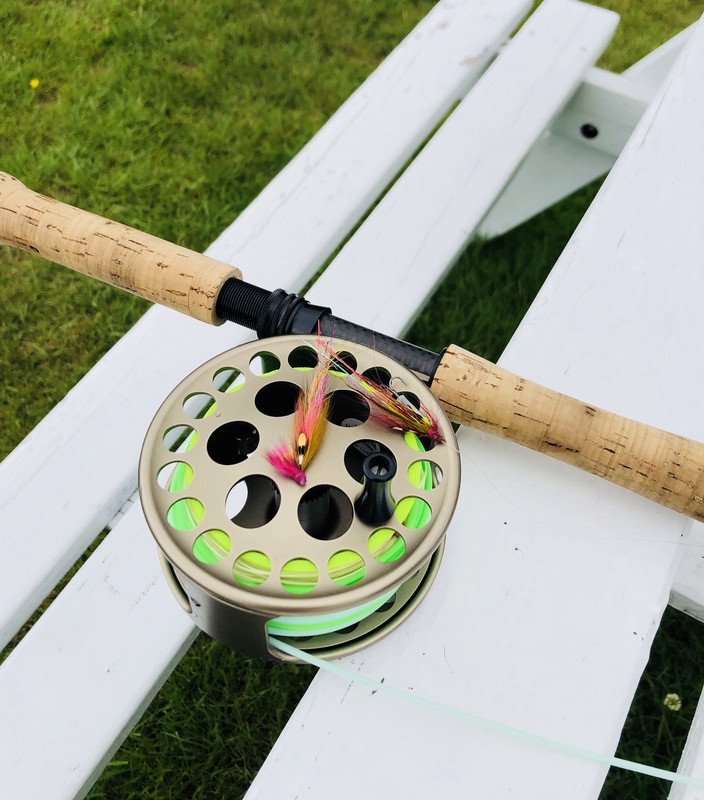 The air temperature did drop mid-week which made it feel more comfortable to fish but this made little difference to the upstream rods battling the extreme low water. No fish were hooked or landed on the upstream beats! The only chance of a fish was down on the Tailrace and even there it was still challenging. However 2 salmon were landed by the club anglers – Rab less had an 11lb and Brian Tolmie a 6lber. The upstream rods had a hold of 2 but sadly they fell off! Both salmon and grilse were seen coming in and out with the tides but I would think that many of them will be further out in the Loch awaiting a change in weather and river conditions. Brian Tolmie – sealiced 6lber. The forecast for next week is not so encouraging. Although there maybe some rain mid-week I doubt it will be sufficient to make any difference to the river……and then a return to brighter days and high temps. When will this drought end??? Water height - 4in - (-1in) Water Temp - 60-70F Our 2 weeks of reasonable conditions and good fishing abruptly ended as the heatwave returned to Lochaber last week. Daytime temperatures peaked at 31deg C and not a cloud to be seen! As expected the river levels dropped quickly and we ended the week with minus of the gauge. Water temperatures also soared, reaching 20 deg C by Saturday afternoon. These conditions are simply no conducive to catching salmon! However our anglers did persevere and the Hurrell party managed to find a taking fish on Beat 1 on Friday evening...... a small reward for their efforts and fishing rather unsociable hours. Down on Tailrace beat things were quiet also. Although fish were seen on most tides, they were not in a taking mood. 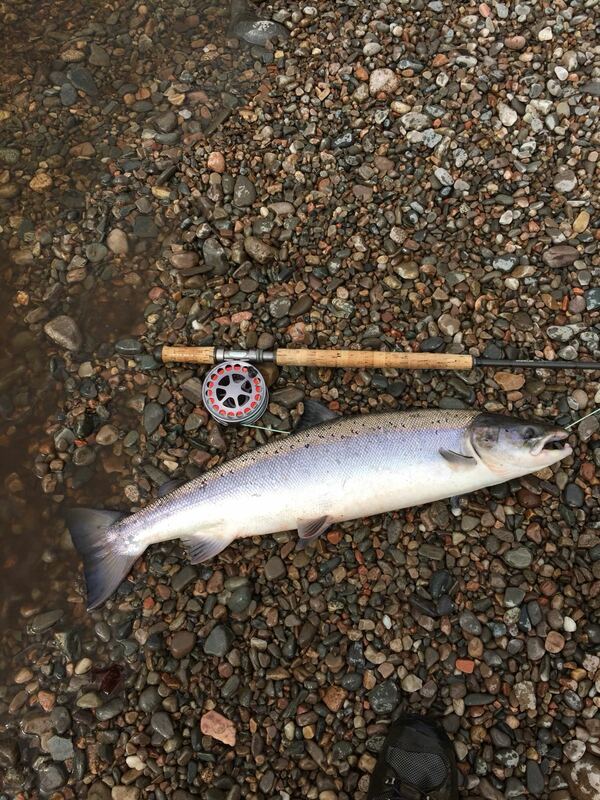 Again, one salmon was landed earlier in the week by Iain Lamont - his first of the season! The forecast does not look too promising for this coming week. More of the same! The Tailrace beat will be the best chance of a fish as they come in and out with the tides. 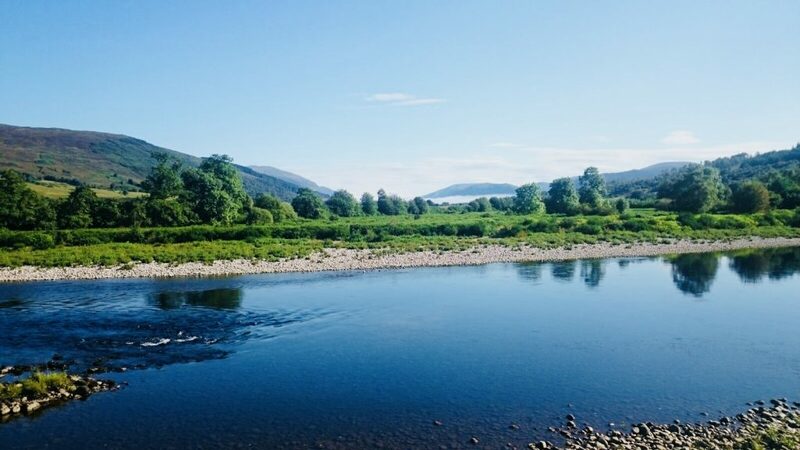 Our 2 weeks of reasonable conditions and good fishing abruptly ended as the heatwave returned to Lochaber last week. Daytime temperatures peaked at 31deg C and not a cloud to be seen! As expected the river levels dropped quickly and we ended the week with minus of the gauge. Water temperatures also soared, reaching 20 deg C by Saturday afternoon. These conditions are simply no conducive to catching salmon! However our anglers did persevere and the Hurrell party managed to find a taking fish on Beat 1 on Friday evening…… a small reward for their efforts and fishing rather unsociable hours. Down on Tailrace beat things were quiet also. Although fish were seen on most tides, they were not in a taking mood. 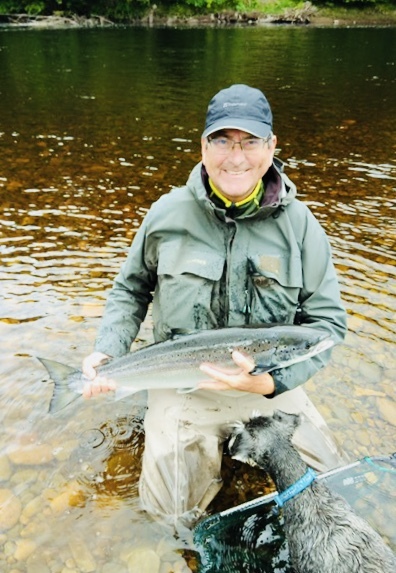 Again, one salmon was landed earlier in the week by Iain Lamont – his first of the season! The forecast does not look too promising for this coming week. More of the same! The Tailrace beat will be the best chance of a fish as they come in and out with the tides. Week Commencing 18th June – Size does matter! 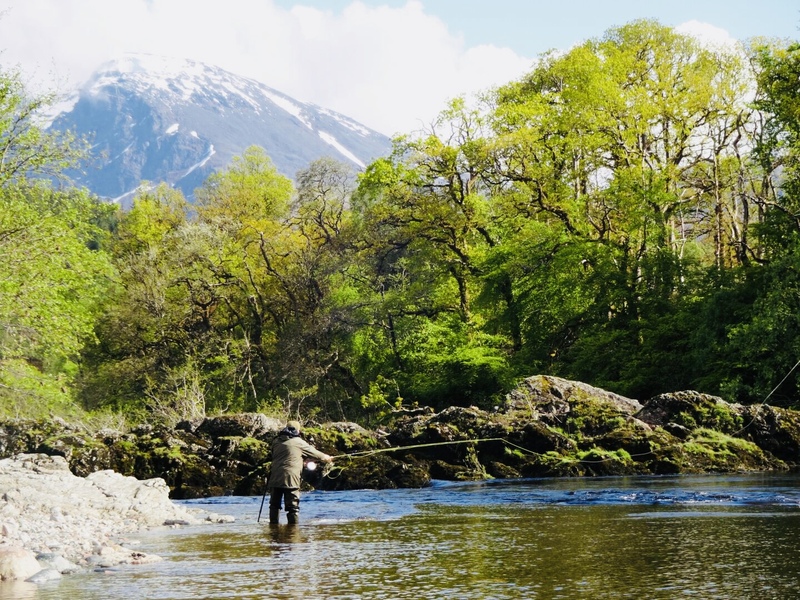 This was more like the spring fishing we have come to expect from the Lochy over the last few years. A total of 13 fish landed and another 8 lost and all but one were double figure salmon with an average weight of 13.5lbs. Conditions, for once, were good throughout the week. 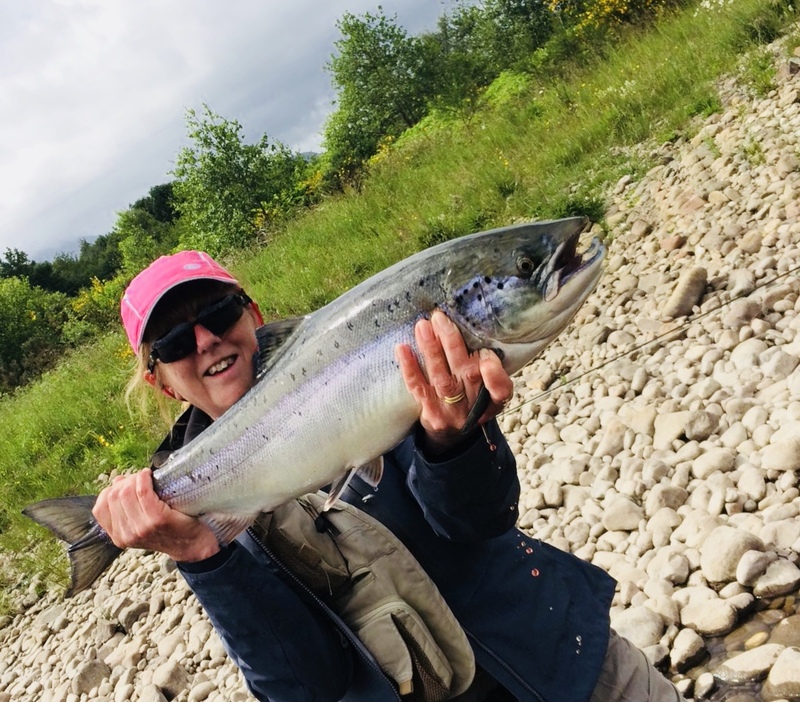 Although the river did fluctuate rather dramatically at times due to some Hydro maintenance – (which may continue into this coming week also) the much cooler temperatures and cloud cover allowed the anglers to fish during normal daytime hours with confidence and success. Christopher Zawadski and Glen Bishop had 3 between them (16, 15, 11lbs) …and Paul Welling had a couple (10, 12lbs) – pictured below – happy angler! Simon Munro and Jenny Wellard also had fish each of 12lbs. I even managed a nice fish myself – there must be a few about!! It was the return of the “Pink Panther” that did the trick! On the club beats there was action at both ends. 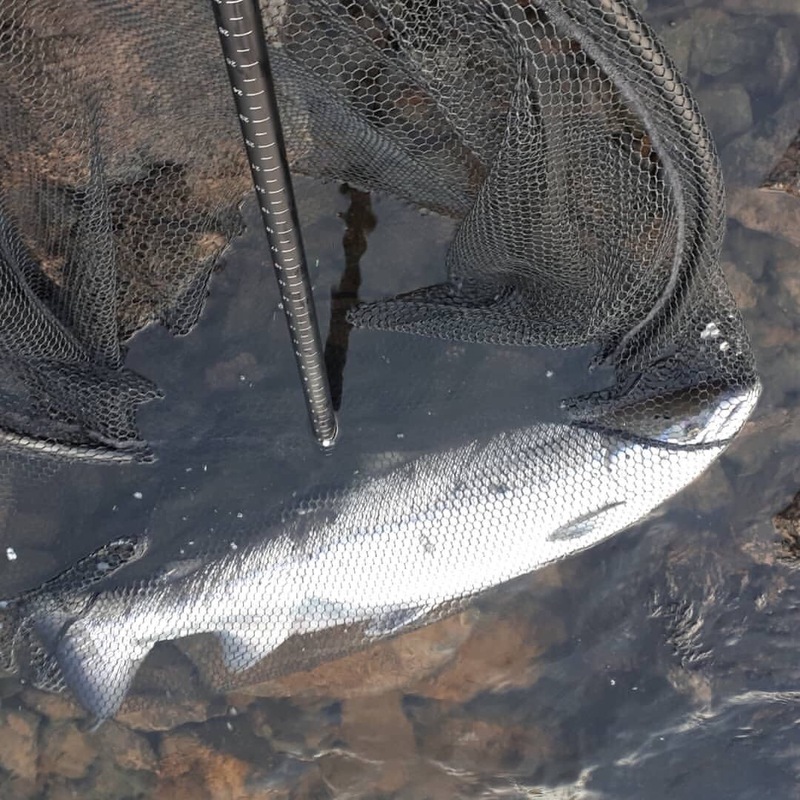 Down on the Tailrace only 1 fish landed to Rory Campbell but it was a nice fresh 13lber – and a returnee from the hatchery smolt programme ! Another larger fish was also landed, but no details or photo unfortunately. In the upper catchment there was action at the start of the week with Andy Burton, Steve Ingram and Billy Neil landing a fish each. Next week sees summer returning with daytime temps heading into the mid-20s. Tides will be building throughout the week so a combination of early and late fishing combined with tide synchronisation may have to be considered. 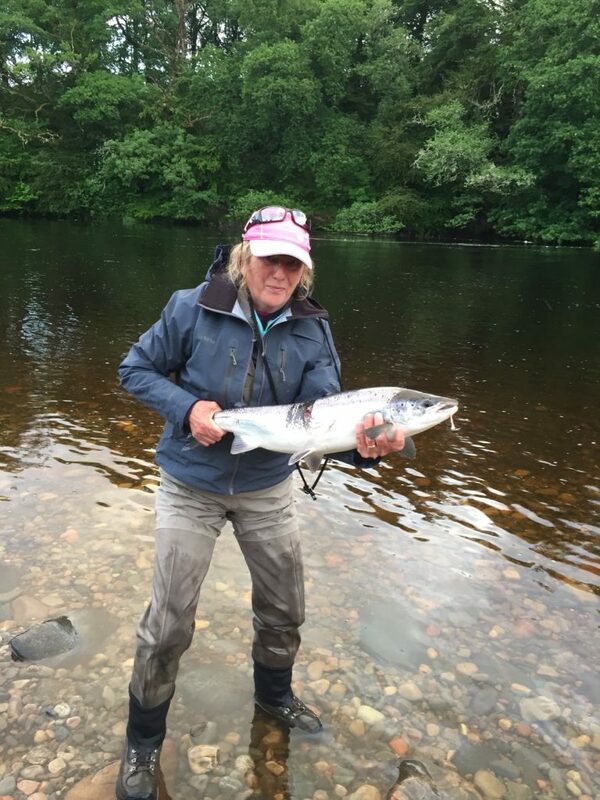 Week commencing 11th June – the rain arrived and so did the salmon! Water height - 0in - 2ft + water temp - 58C I am currently travelling back from a hard trip to Norway so I will make this quite brief. In short, the Lochy is back on form. The rains finally came, the river rose and the salmon were there! The start of the week was slow but once the river settled back from a good rise the fish responded. Friday and Saturday were the best days with 10 fish hooked and 8 landed.....with only light angling pressure. It was also pleasing to see a couple of these fish being from hatchery origin. Jon Gibb with a cracking 18lb hatchery salmon Jenny Wellard with a nice 10lber from Falls pool. Steve Wellard’s 14lber from Rock pool on beat 1. Up on the Spean, there was plenty action also. Club anglers out on Thursday and Friday had some good sport. I think around 6 fish were landed and a few lost, including another fin clipped salmon. 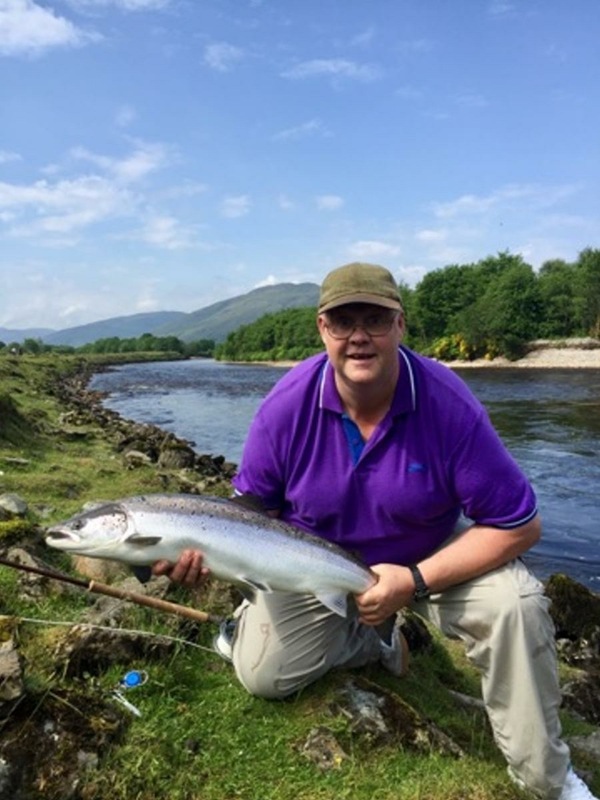 Andy Burton with a nice fish from the Spean. As the weather remains unsettled into next week the river should hold its levels and hopefully the fishing will remain good. I am currently travelling back from a hard trip to Norway so I will make this quite brief. In short, the Lochy is back on form. The rains finally came, the river rose and the salmon were there! The start of the week was slow but once the river settled back from a good rise the fish responded. Friday and Saturday were the best days with 10 fish hooked and 8 landed…..with only light angling pressure. It was also pleasing to see a couple of these fish being from hatchery origin. Jenny Wellard with a nice 10lber from Falls pool. Steve Wellard’s 14lber from Rock pool on beat 1. Up on the Spean, there was plenty action also. Club anglers out on Thursday and Friday had some good sport. I think around 6 fish were landed and a few lost, including another fin clipped salmon. 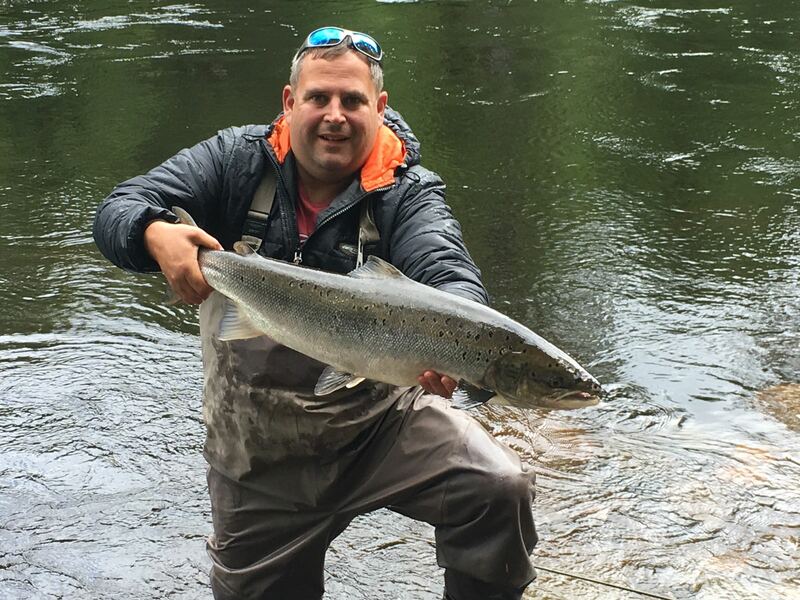 Andy Burton with a nice fish from the Spean. As the weather remains unsettled into next week the river should hold its levels and hopefully the fishing will remain good. 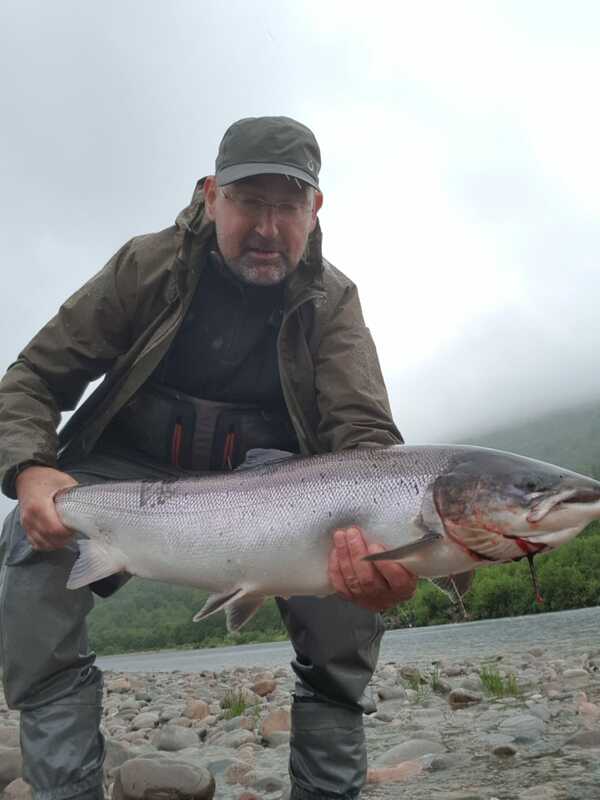 Week Commencing June 4th – Team Switzerland deliver in low water conditions…and Tailrace continues to fish well! As I mentioned in my last report, we did get the anticipated rise in water from last weekend’s rain – it went up over 1ft on both Sunday morning and again on Monday. However, it didn’t really help our anglers nor the upstream fishing unfortunately. Monday was simply a right-off as the river was running brown in colour for most of the day (This isn’t typical of the Lochy, but with no Hydro water dilution, the water takes much longer to clear). With very hot daytimes temps, the rain that fell was also warm and the water temp shot up to 68F. It took 24 hrs to drop back to normal temperature. By Tuesday the river was down to a few inches on the gauge and only a hint of colour but still no taking fish were to be found. However we did see quite a number of new salmon at the Mucomir Dam outflow – they clearly ran straight through on the initial lift in water levels….. Very frustrating!!! It was Wednesday before were managed to put a fish in the book – a 5lb grilse from beat 3. Another salmon was caught on Thursday – a 10lber from Beat 4. Both were caught by our 2 Swiss anglers – Rene and Thorsten. Thorsten also had a 7lb brown trout (on a 5wt rod and light leader) which I guess made his trip to the lochy somewhat memorable. Down on the Tailrace, there was more action and its was Chris Cairns and Paul McHugh who were leading the way again. Chris had a 10lber while Paul had one around 14lbs. Sadly no photos. 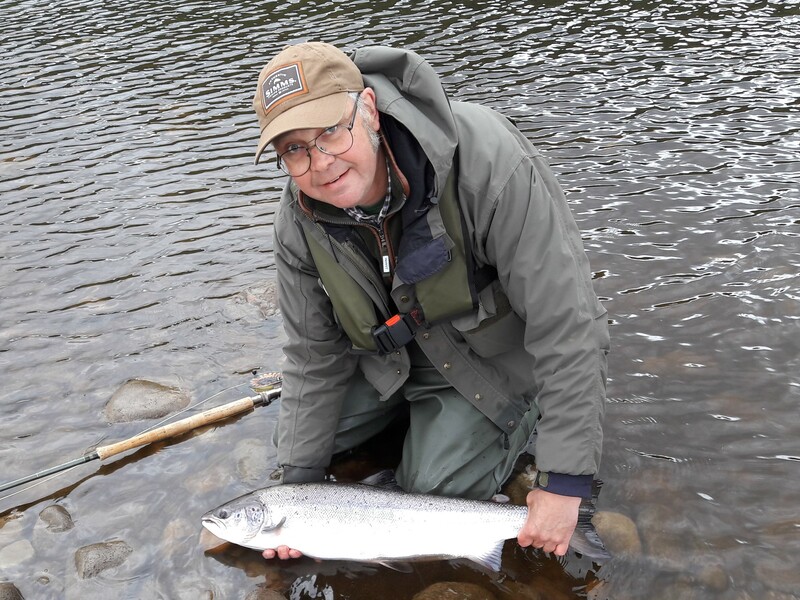 On Friday, it was one of our upstream rods- Andy Burton who stole the headlines – a lovely 12lbs bar of silver. As the week drew to a close club member Richard MacDonald got his season underway with 2 cracking fish on Saturday morning. The forecast looks more promising for next week and the Met office are predicting a change mid-week. This would be most welcome as the river is becoming desperately low. Week Commencing 28th May – Tough conditions but the fish are there! River Level - 2-3in River Temp - 60F This was not the ideal salmon fishing week! 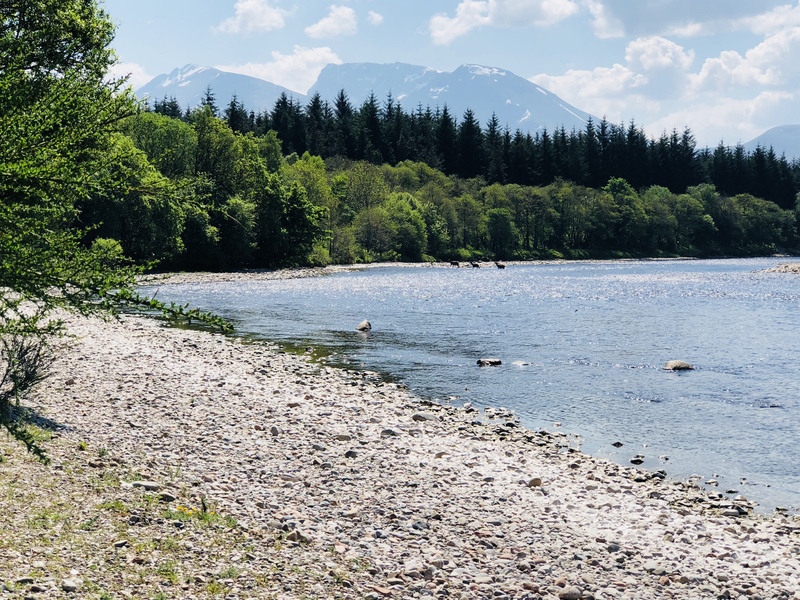 With daytime temps reaching 27C and cloudless skies for most days, Lochaber was more like the Costa Del Sol, than the west coast of Scotland. I can't honestly remember having sustained weather like this in May ever before. Suffice to say, the fishing upstream on the beats was extremely hard going. 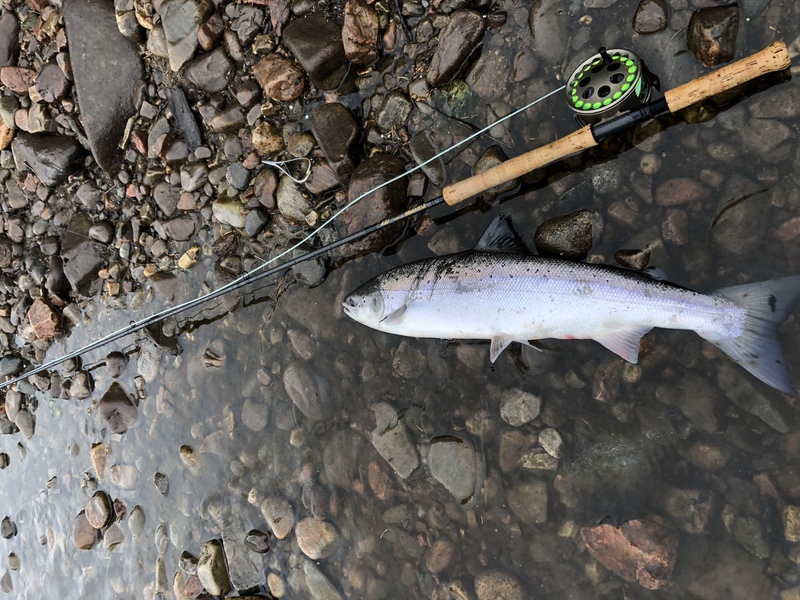 With just a couple of inches on the gauge and no night time tides, it was apparent that the salmon decided not to run......and thus we had not a touch on the beats 1-4. However, down in the estuary beat (Tailrace) the situation was rather different. Fish were seen daily coming in and out on the tide and the club anglers had some welcome action. 3 salmon were landed - a 14lber for Robert Ralston, a 13lber for Chris Cairns.......and a cracking 20lber for Paul McHugh-pictured below. All were sealiced. So, although our anglers maybe going home feeling slightly deflated, albeit with a nice tan, it is pleasing to know we have a number of fish waiting to run the river when conditions change! Ironically that change may have happened last night! After some heavy thunder showers up the valley yesterday evening, the river rose to over 1ft during the night so hopefully this may have enticed a few fish to run. We should find on Monday. The forecast still looks summer-like for the next few days, but less warm than last week.......and maybe an odd thundery shower also. The tides will be dropping, but high tide will moving to night-time, which may help. Next weeks anglers should come prepared for low water conditions upstream and fishing early and late! This was not the ideal salmon fishing week! With daytime temps reaching 27C and cloudless skies for most days, Lochaber was more like the Costa Del Sol, than the west coast of Scotland. I can’t honestly remember having sustained weather like this in May ever before. Suffice to say, the fishing upstream on the beats was extremely hard going. 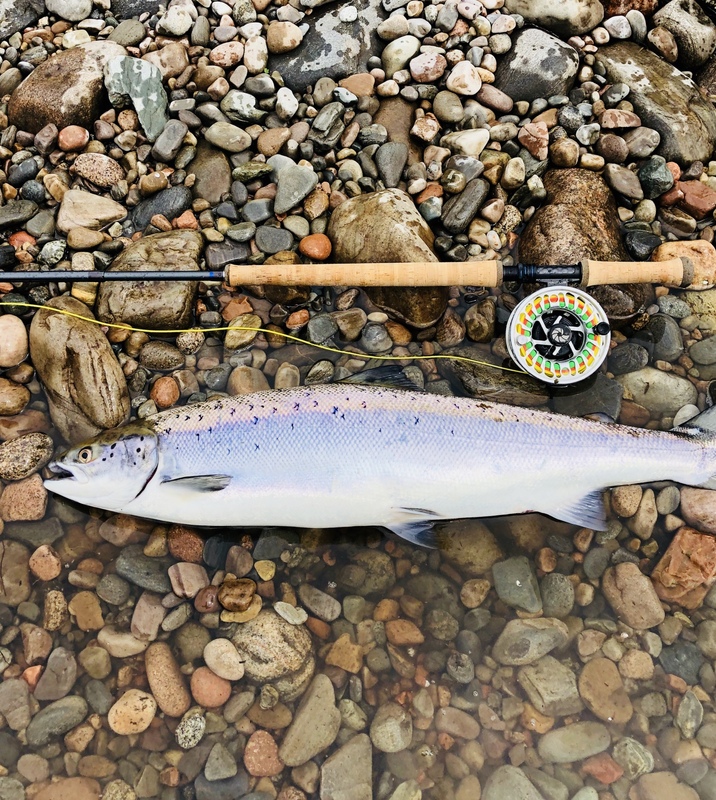 With just a couple of inches on the gauge and no night time tides, it was apparent that the salmon decided not to run……and thus we had not a touch on the beats 1-4. However, down in the estuary beat (Tailrace) the situation was rather different. Fish were seen daily coming in and out on the tide and the club anglers had some welcome action. 3 salmon were landed – a 14lber for Robert Ralston, a 13lber for Chris Cairns…….and a cracking 20lber for Paul McHugh-pictured below. All were sealiced. So, although our anglers maybe going home feeling slightly deflated, albeit with a nice tan, it is pleasing to know we have a number of fish waiting to run the river when conditions change! Ironically that change may have happened last night! After some heavy thunder showers up the valley yesterday evening, the river rose to over 1ft during the night so hopefully this may have enticed a few fish to run. We should find on Monday. The forecast still looks summer-like for the next few days, but less warm than last week…….and maybe an odd thundery shower also. The tides will be dropping, but high tide will moving to night-time, which may help. Next weeks anglers should come prepared for low water conditions upstream and fishing early and late! River Height - 7in-1ft 2. River temp - 48-55 DegF After a promising start to the week the clouds disappeared, the temperatures soared and an east wind prevailed - not ideal for catching salmon! Monday saw overcast conditions with some rain and the river slowly rising to over 1ft. 2 fish were landed. Charlie Spencer had this cracking 16lber from Beat 4. I also managed a lovely 8lber from beat 2. The weather changed on Tuesday and high pressure set in for the remainder of the week. The few fish in the river seemed to disappear and any new fish seemed reluctant to run....or if they did, it was during the hours of darkness and we never saw them! No other fish were seen nor touched! .....but we did see three Roe Deer having a paddle on Beat 2. On the club beats Craig MacIsaac was proving again what a good young angler he is. 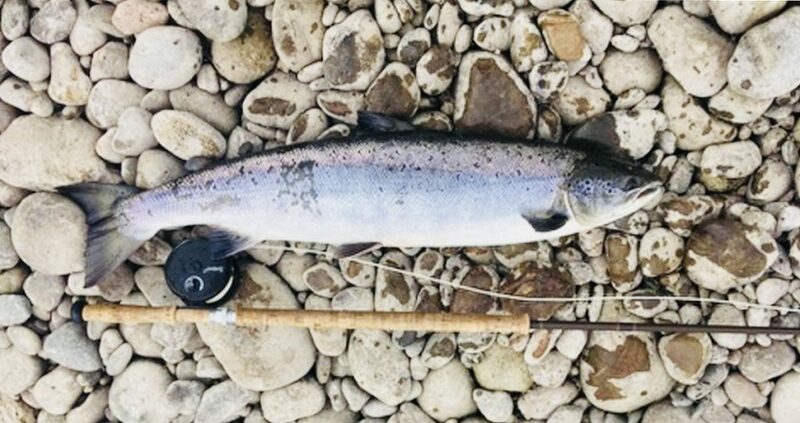 He landed a lovely fresh 14lber on Mucomir on Wednesday night - quite possibly a fish that came in on the rise in water at the start of the week. On Thursday we had the first fish from the Tailrace - a 14lber caught by Mark Ward. Another was lost on Saturday. So, despite the upriver height and temp being reasonable for this time of year, the Tailrace seems to be where they are stopping for now? The summer weather looks set to stay with us for most of next week but with bigger tides the fish may start to move slowly upstream. River Height – 7in-1ft 2. 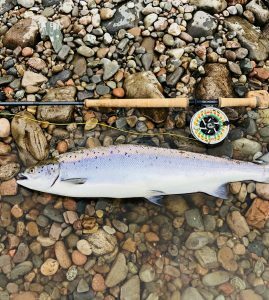 After a promising start to the week the clouds disappeared, the temperatures soared and an east wind prevailed – not ideal for catching salmon! Monday saw overcast conditions with some rain and the river slowly rising to over 1ft. 2 fish were landed. Charlie Spencer had this cracking 16lber from Beat 4. I also managed a lovely 8lber from beat 2. The weather changed on Tuesday and high pressure set in for the remainder of the week. The few fish in the river seemed to disappear and any new fish seemed reluctant to run….or if they did, it was during the hours of darkness and we never saw them! No other fish were seen nor touched! …..but we did see three Roe Deer having a paddle on Beat 2. On the club beats Craig MacIsaac was proving again what a good young angler he is. 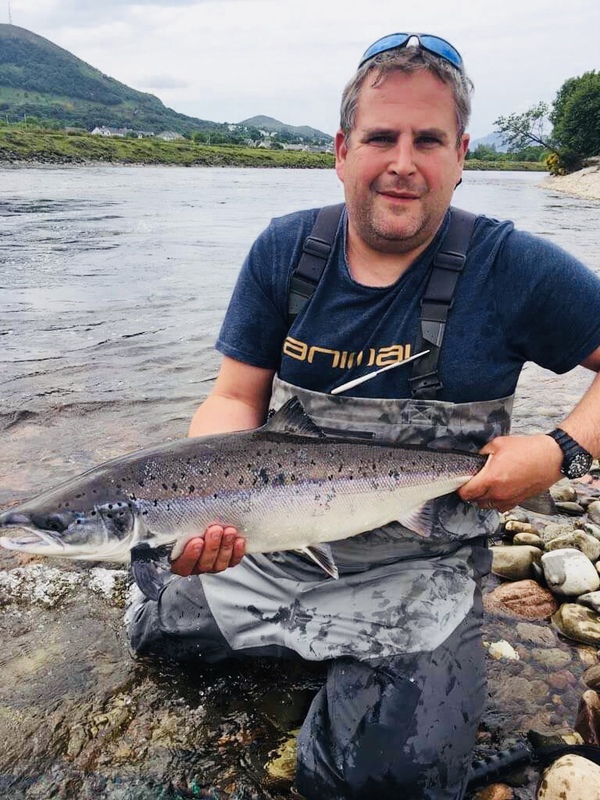 He landed a lovely fresh 14lber on Mucomir on Wednesday night – quite possibly a fish that came in on the rise in water at the start of the week. 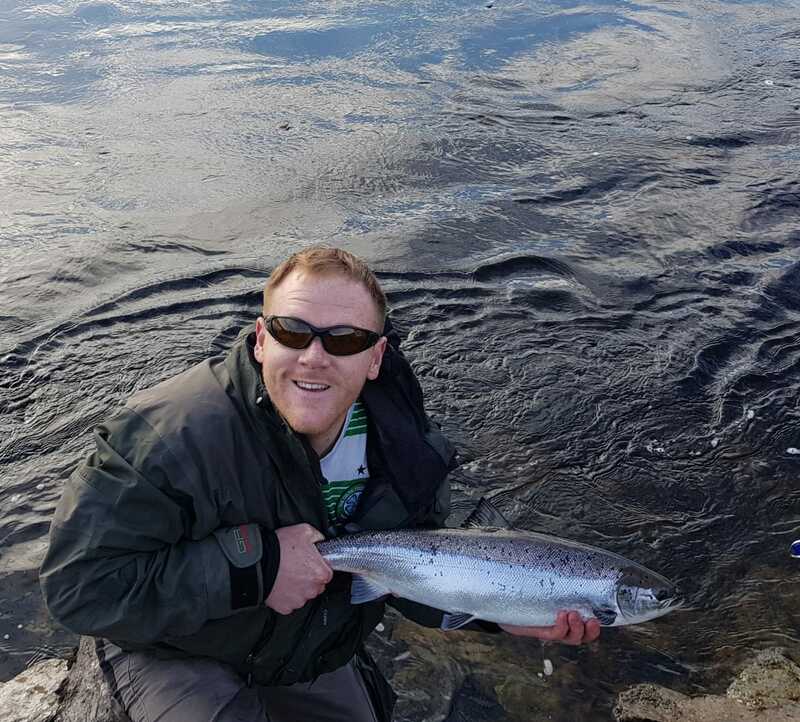 On Thursday we had the first fish from the Tailrace – a 14lber caught by Mark Ward. Another was lost on Saturday. So, despite the upriver height and temp being reasonable for this time of year, the Tailrace seems to be where they are stopping for now? The summer weather looks set to stay with us for most of next week but with bigger tides the fish may start to move slowly upstream. Our first tenants of 2018 arrived to blue skies and sunny conditions……Spring had finally arrived in Lochaber! These conditions are usually seen as detrimental to catching fish, but this is not always the case. Fresh, sea-liced salmon are not so fussy when it comes to overhead conditions and almost all our May fish are straight from the sea. The key to success is keeping the fly in the water and finding a fresh run salmon in a likely resting spot. The start of the week passed with a few sightings of running fish but only one hooked and lost. 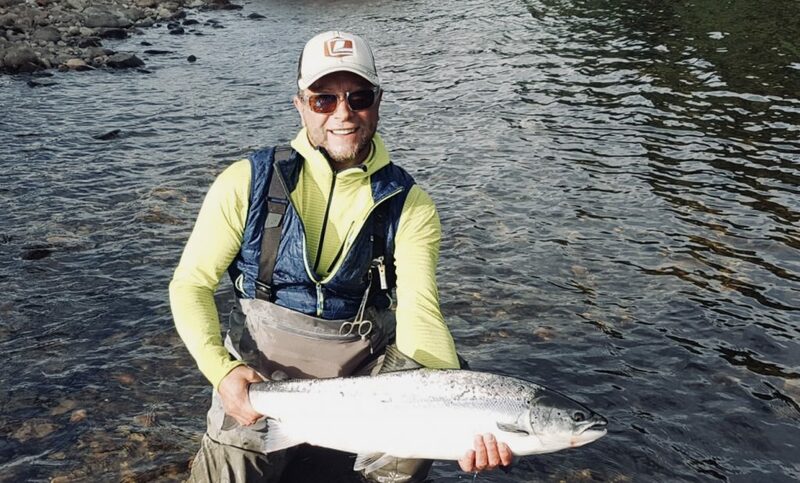 As the river levels dropped below the 1ft mark the salmon started to hold a bit longer in the pools (As expected) and it was our man Ron Powell from the Oregon-USA that got the first one in the book – a lovely 12lber from Larch Tree on Beat 4. He quickly added another but this one was double the size of the first. 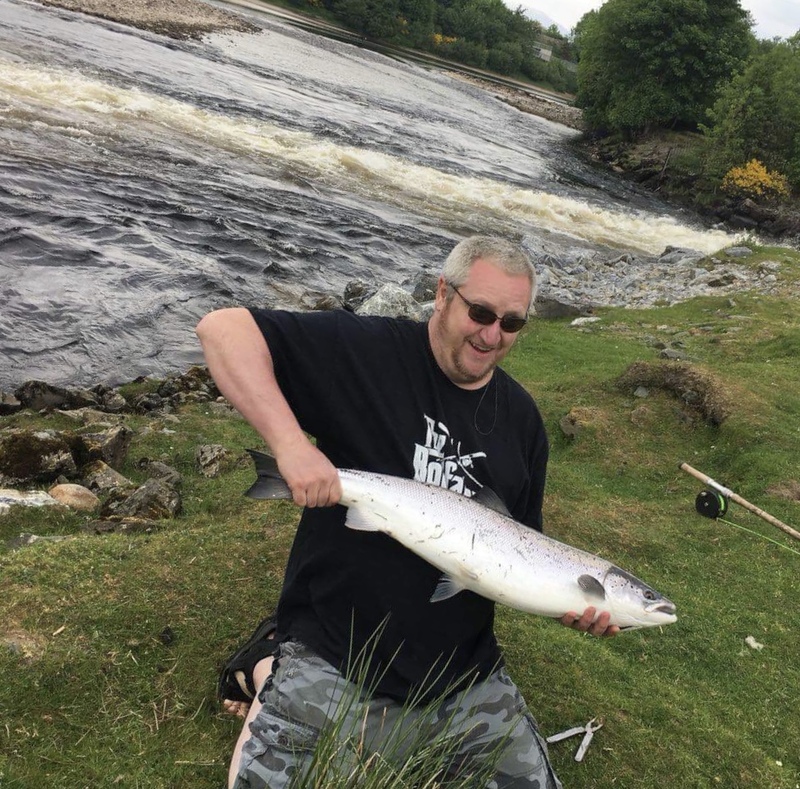 A cracking 39in Lochy springer. (Unfortunately his phone camera would not work, so no trophy shot for Ron!!) Not settling for just the two, he then hooked another (in the same pool) but unfortunately this one didn’t stick. However not a bad mornings work for Ron. All 3 were hooked on one of his Steelhead intruder flies……and in bright sunshine!! Well done Ron. A couple more were lost on beat 4 that morning and then the fish moved on! Surprising nothing was seen above on Beat 3 in the afternoon. Friday produced another fish (an 8lber-small for this time of year) for Michael Mann on Beat 1 and another lost on Beat 2. Saturday was quieter with no fish seen and just 1 other lost on Beat 1. It would seem we are awaiting the next batch of fish to come in! Next week sees the tides dropping back but there maybe some rain in the catchment on Monday?? From Thursday it looks to be turning much warmer. Spring to summer in the space of a week! With current water levels, salmon should move through slowly, giving the anglers some chance on intercepting.